Minnie Gallegos, who has chaired the Santa Fe County Democratic Party for the past seven years, won’t seek re-election next year. She’s been county chairwoman since November 2001, after then-chairman Bill Sisneros stepped down to join Bill Richardson’s gubernatorial exploratory committee. 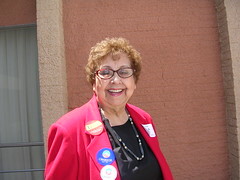 In 2003, Gallegos was elected in her own right, becoming the first woman elected to the county party post. 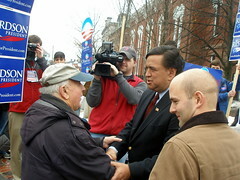 She won re-election in 2005 and again in 2007. Gallegos has held the position longer than anyone else in recent history. In the seven years before Gallegos became chairwoman, the position was held by four men — Sisneros, Art Bonal, Fernando Rivera and Domingo Martinez. In the last election there had been some grumbling from the rank-and-file about Gallegos. No major controversy. Most of the gripes seemed to be about the way Gallegos runs meetings. After covering the meeting at which she was re-elected last year, I wrote that the proceedings “reminded some attendees of the old Will Rogers quote — ‘I am not a member of any organized political party. I am a Democrat.’ ” It took more than an hour that night just for all the county central committee members to get through the door, register and get their credentials. Gallegos did have a challenger last year: party activist Ricardo Campos. But once he realized he didn’t have the votes, Campos withdrew and moved to elect Gallegos by acclamation. Campos then was elected vice chairman by acclamation. If there’s been any dissatisfaction with Gallegos since then, it has not been made public. Election trivia: A couple of incumbent Republican legislators actually beat Democratic challengers in this county by 2-to-1 margins. State Sen. Sue Beffort Wilson beat Democrat Jason Michael Burnett here while Rep. Kathy McCoy defeated Janice Saxton. Both of these legislative districts are mostly in Bernalillo County but each contains a small pocket of precincts in the more conservative southern part of Santa Fe County. Richardson watch: Most of the recent national chatter about our governor’s chances of being appointed U.S. secretary of state has been in the context of Richardson being a alternate to Hillary Clinton for that job. Radio daze: After last week’s column about the elimination of Christmas lights for Human Service Department employees in an effort to save money, one state worker called to say that employees in her office were told they can’t even play radios at their desk. I didn’t immediately mount an investigation of this. But it is true that a memo from the governor on Oct. 23 about conservation in the state workplace says, “Personal space heaters and individual appliances (refrigerators, microwaves, etc.) are no longer allowed in staff offices or cubicles.” It’s quite possible that some supervisors have interpreted “individual appliances” to include radios. I suppose workers could bring in iPods — as long as they didn’t plug the devices into state computers to recharge them. Or maybe HSD and other state employees could take a tip from the Cultural Affairs Department’s proposal to have a private foundation augment the pay of state museum curators and directors. Perhaps they could get New Mexico broadcasters to set up a foundation to help pay the state’s electric bill so that workers can play a radio now and then. The photo of Minnie Gallegos near the top of this post is by Barb Wold, used under Creative Commons license and found on FLICKR. UPDATE: I just corrected a spelling mistake in the "Richardson Watch" section above. As a reader pointed out, "security breeches" sounds like some sort of new uniform at LANL. That'll teach me to cut-and-paste from a rag like The New York Times.